Now I have to say this phone is really something different, there aren't many of these in the world, and in fact it was a limited launch that started in Korea to begin with and only 1000 of these phones were being made available to consumers with the release number stamped on the back of the phone. The Iron Man Galaxy S6 Edge is more of a collector’s item than a regular every day phone (but it still can be used as an everyday phone). 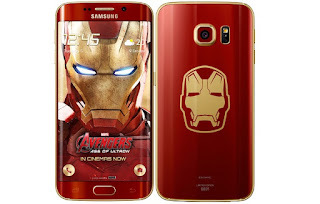 The design of the phone is inspired by Tony Stark's Iron Man suit. It has the same 5.1 inch quad HD dual edge display as the regular S6 Edge coupled with custom internals, 64 gigabytes of storage and a 16 megapixel camera. It is also outfitted with that Iron Man red body and gold accents which are pretty hot and when you pair that with the arc reactor wireless charger, that my friends is a winning combination. It also comes with a pair of headphones, a slick USB cable, a wall charger and some pointless paper and a fancy clear case so you don’t scratch the crap out of your fancy new phone should you decide to use it for everyday life. I am a little mixed about the giant Iron Man face smashed right on the back, I kind of wish it was a little smaller or actually did something like have the eyes light up, now that would be all kinds of awesome. 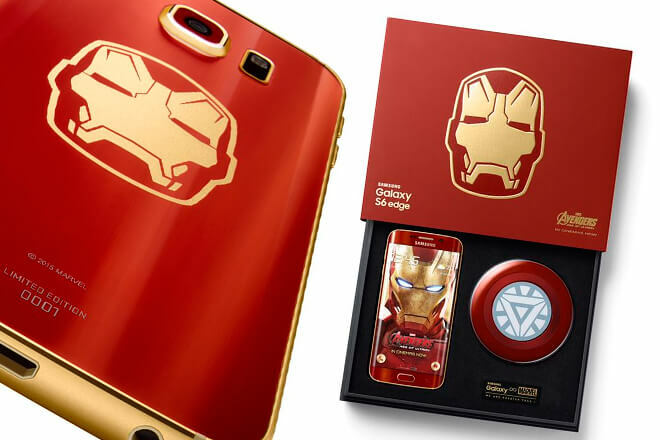 It comes sporting a custom Iron Man theme (a variant of the Iron Man theme already in the Samsung Theme Store) with sharp red and gold (instead of silver) and it effects the whole look of the phone right down to the icons such as the dialer, contacts, messages and even the app drawer. You also get a new sound pack and four wallpapers to choose from which is actually three because one is basically a giant ad letting you know that the Avengers is in theatres now. What I thought that might be the biggest shame of this phone is the fact that you don’t actually get Jarvis, you do however still get Google which compared to Siri is a clear second to Jarvis. Joking aside, it really is a shame Samsung didn't make these more widely available especially with the insane reaction to the launch video, I think they could have killed it especially in the United States and Europe. With such scarcity of this phone, it has been fetching obscene prices on eBay with one Chinese fan who paid an unbelievable ninety one thousand dollars for this phone, so get ready to shell out the big bucks if you want to purchase this phone. If you are lucky enough to find one on eBay most are going for a price of somewhere between twenty eight to forty five hundred dollars. Well I hope you enjoyed this post. Tell us what you think in the comments below and I’ll see you in the next post. 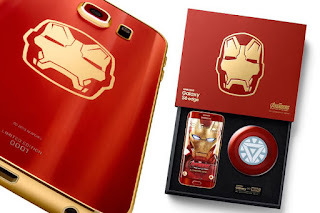 I love the Iron Man as he is really one of the coolest characters in Marvel and this is really an awesome phone.